Topps announced this morning that “Big Papi” David Ortiz will assume duties in a new role with the company as a spokesperson and TOPPS NOW lead scout. 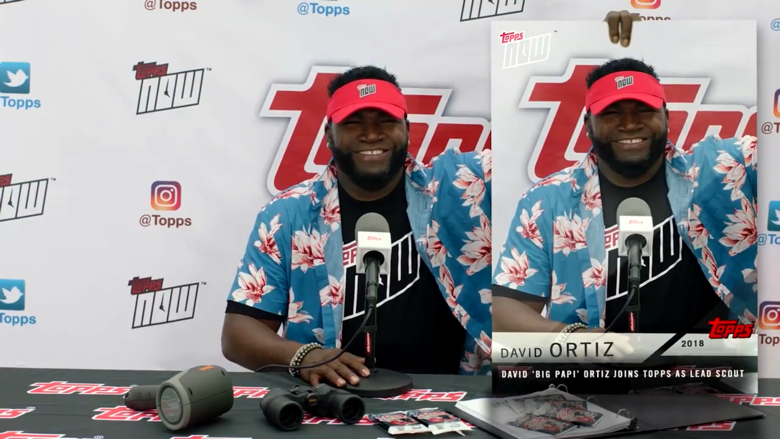 In this role, Ortiz will work with the Topps team in picking the best moments of the Major League Baseball season and support Topps’ initiatives throughout the year, including National Baseball Card Day, which is held on the second Saturday in August. Clearly a major consideration in teaming with Ortiz was his fun loving personality that matches well with their current push to keep collecting fun, as can be seen is this promotional video announcing Ortiz’s new role with Topps. TOPPS NOW baseball cards, which are only available on Topps.com, celebrate the greatest moments and milestones from the MLB season. The physical cards are available to purchase the very next day through Topps.com, but for just 24 hours, and will not be available again. Only the number of cards ordered during that 24-hour window are printed. TOPPS NOW has featured the Chicago Cubs and Houston Astros winning the World Series; Ichiro, Adrian Beltre and Albert Pujols getting their respective 3,000th career MLB hits; and rookie debuts, including Shohei Ohtani, Aaron Judge, Ronald Acuña Jr., and more.